easy Authentic Pico De Gallo - makes EVERYHING better! 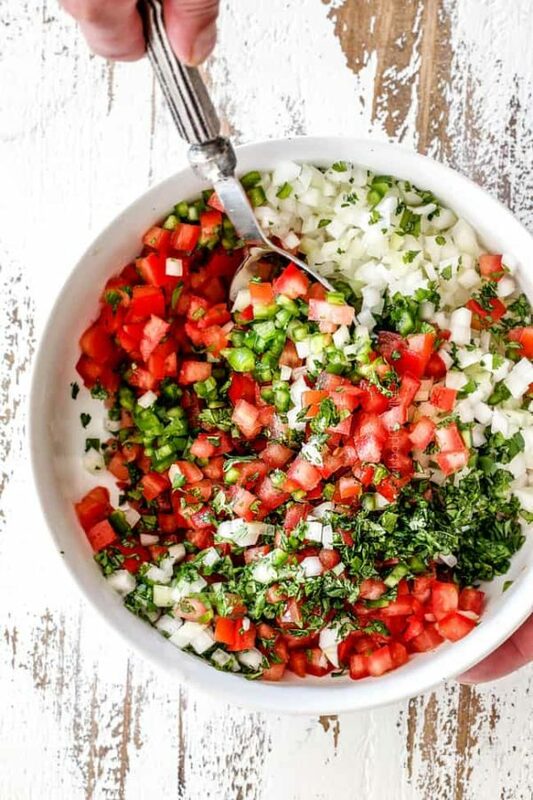 Pico de Gallo is quick and easy, made with only a handful of ingredients, amazingly fresh and healthy and makes everything taste 1000X better! 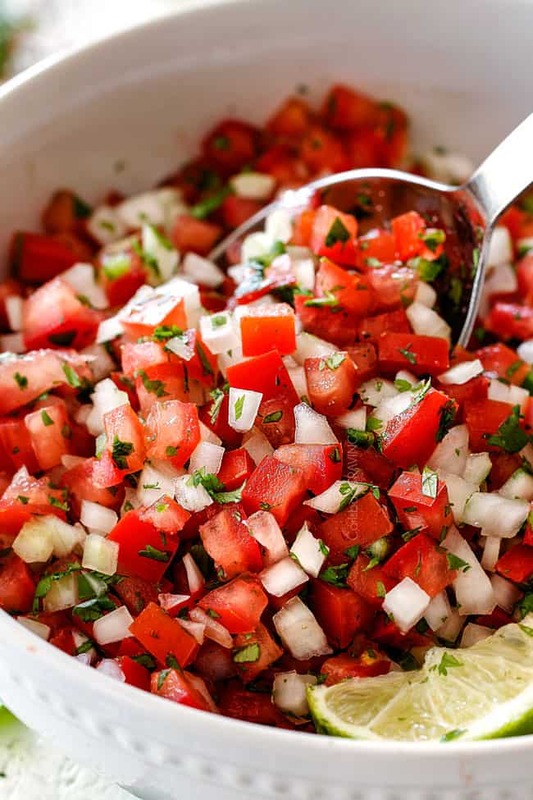 Pico de Gallo, AKA fresh tomato salsa, is made with tomatoes, onions, cilantro, jalapenos, lime juice and salt. 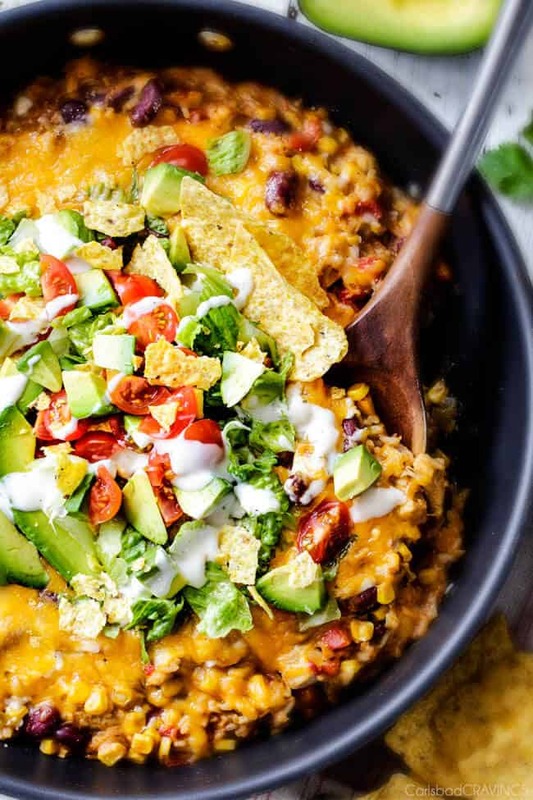 It takes minutes to whip up and is great as a party appetizer, snack with chips, or pile it on your favorite enchiladas, nachos, tacos and more! Living in Carlsbad (Southern California), we go out to Mexican food a LOT. No matter what I order, I ensure there is a big pile of fresh Pico de Gallo on my plate. It’s a staple at every Mexican restaurant and at every Mexican table for a reason. 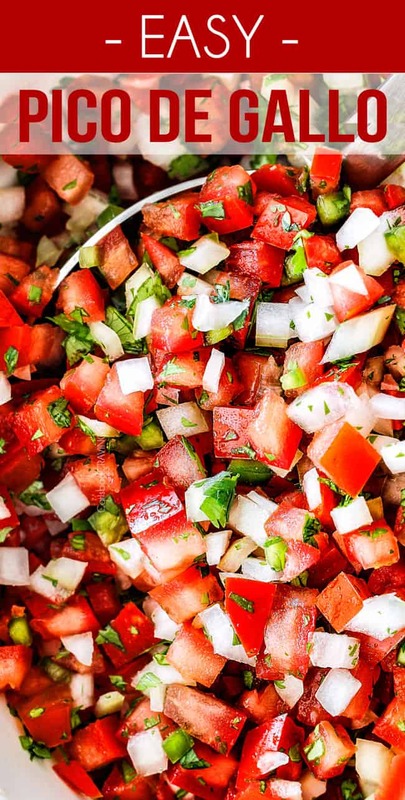 It simply doesn’t get much easier or more freshly delicious than Pico de Gallo. It adds a punch of vibrant flavor to every dish or is just as delicious scooped up by a chip. 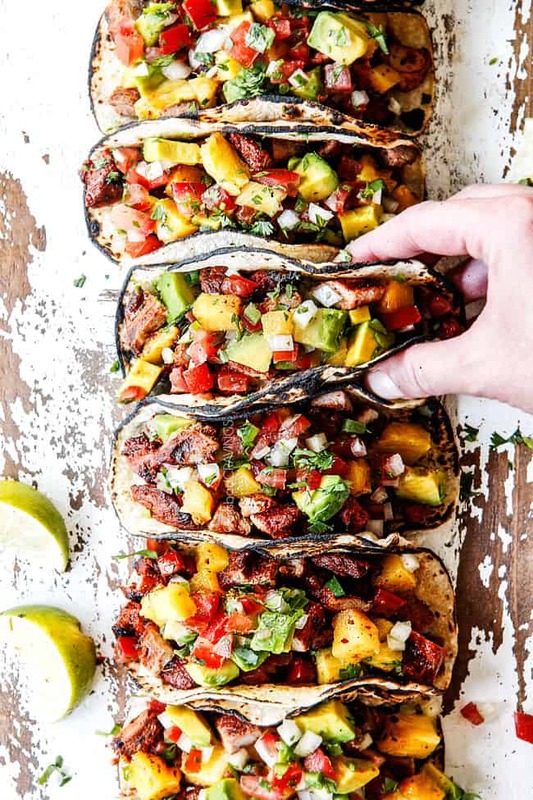 So to make every Mexican dish you serve better and in preparation of my Al Pastor Tacos coming later this week (below – eeek! so excited to share! ), I thought it high time I brought you this easyPico de Gallo recipe. So in other words, you need this Pico de Gallo recipe in your life and more importantly in your mouth. 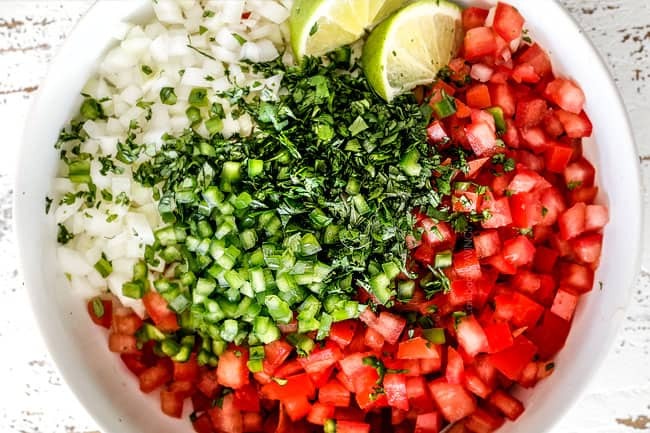 Pico de Gallo is also known as salsa fresca (fresh salsa), salsa cruda (raw salsa), salsa huevona (lazy salsa), salsa mexicana (Mexican sauce) and lastly, salsa bandera (flag sauce) because it is red, white and green like the Mexican flag. Pico de Gallo is a is a fresh, chunky salsa that belongs to the trinity of salsas along with salsa verde and traditional red salsa. It is super quick and easy to make at home and is sooo fresh you will want to spoon it on everything! Why do They Call it Pico De Gallo? Pico de Gallo (pronounced “peek-o day guy-o”) literally means “beak of rooster” in Spanish. 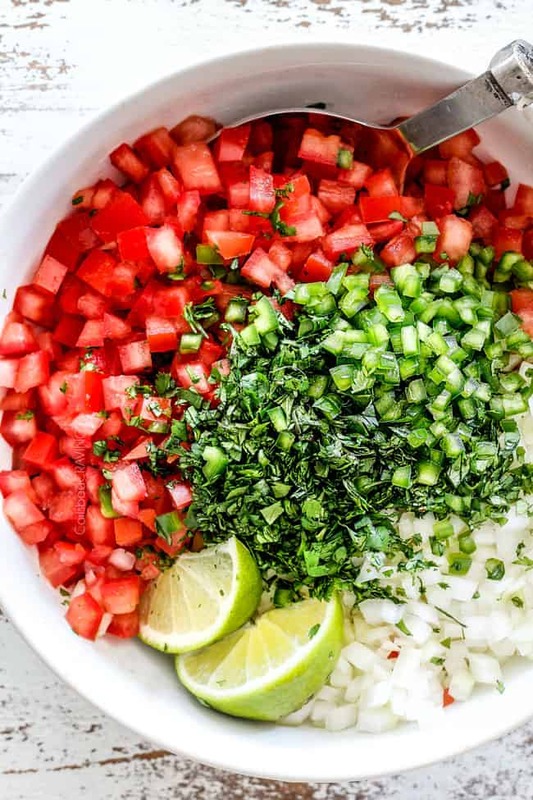 Some say Pico de Gallo gets its name for the red, green and white coloring which resembles the bright colors of a rooster. Others say it’s because it might have been eaten using the thumb and forefingers which resemble a pecking rooster’s beak. So although we don’t know the exact origin of the term Pico de Gallo, we do know, for a fact, that it’s delicious. And that’s all I need to know. WHAT IS THE DIFFERENCE BETWEEN PICO DE GALLO AND SALSA? Both Salsa Verde and traditional red salsa often use roasted tomatillos or roasted tomatoes. Salsa Verde is always blended and red salsa is almost always blended so they are more liquidy and “sauce” like. Pico de Gallo, on the other hand is always served raw and chopped. There are also many variations of ingredients when it comes to other salsas. Pico de Gallo, however, always starts with the same 6 fresh ingredients. If you want to get creative, I’ve added a long list of How to Customize your Pico De Gallo later in the post, but the base is still the same ingredients. YES! 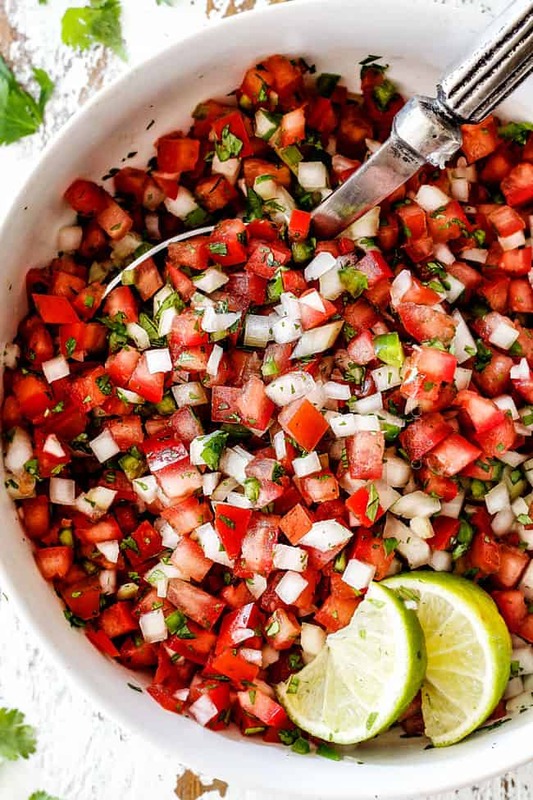 While many of my Mexican favorites can be classified as “comfort food,” Pico de Gallo is nothing but guilt-free freshness. Its comprised of vegetables so it is low calories and contains zero fat so EAT away! And keep on eating. WHAT GOES IN PICO DE GALLO? Tomatoes. Choose deeply colored, firm with-with-a-little-give, ripe tomatoes for maximum flavor because this recipe centers around the tomatoes. We want ripe for flavor but not too ripe or they will get mushy and fall apart. Also, make sure they smell like a tomato – if they don’t smell then they will taste like cardboard. You can use plum tomatoes, but I prefer Roma tomatoes because they have fewer seeds to scoop out. 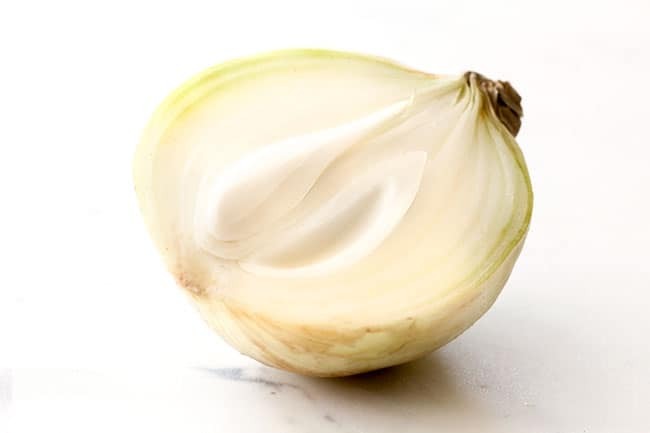 White onion.Whenever a recipe calls for an onion but it doesn’t specify what kind, it means to use a yellow onion. In this Pico de Gallo recipe, however, we want a white onion as specified. White onions are shaper in flavor and boast a more pungent flavor which we want to balance the tomatoes, cilantro and lime. You can use more or less chopped onion than called for. 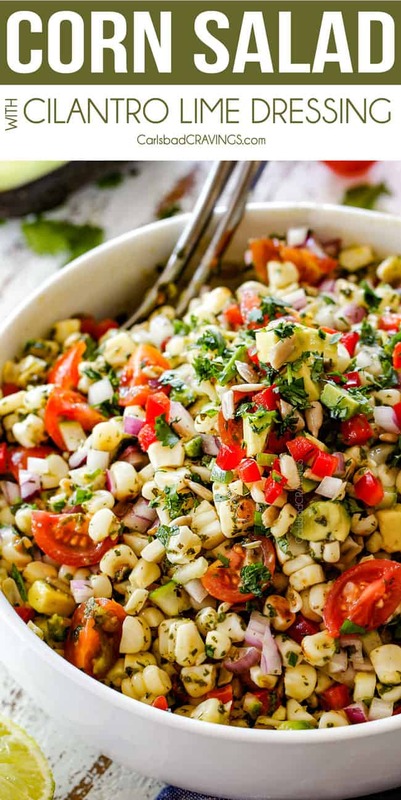 My husband likes less onion than the traditional Pico de Gallo recipe, so I will often withhold some chopped onion from a portion and mix more onion in the rest. 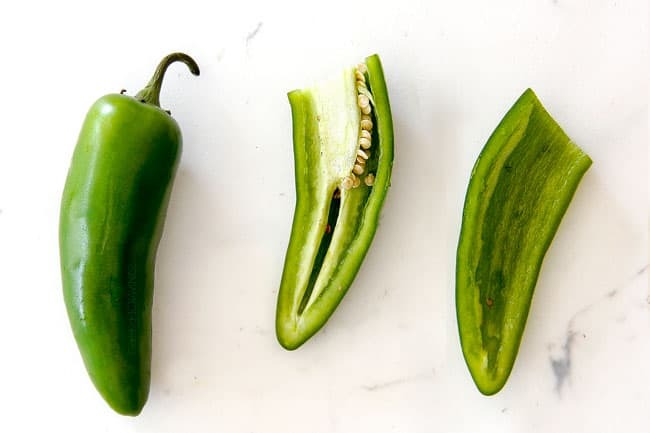 Jalapeno or serrano pepper. I prefer jalapenos for Pico de Gallo because its’ not supposed to be spicy, in my opinion, just flavorful. If you know you love spicy, then go for the serrano. And always, never rub your eyes after dicing a hot pepper or use gloves to be extra safe. Cilantro. Typically, in my recipes, I just ask for “cilantro” and I don’t need you to remove the cilantro leaves from the stem. In this Pico De Gallo recipe, however, you will want to remove the stem and just use the leaves. If you loooove cilantro – add more! 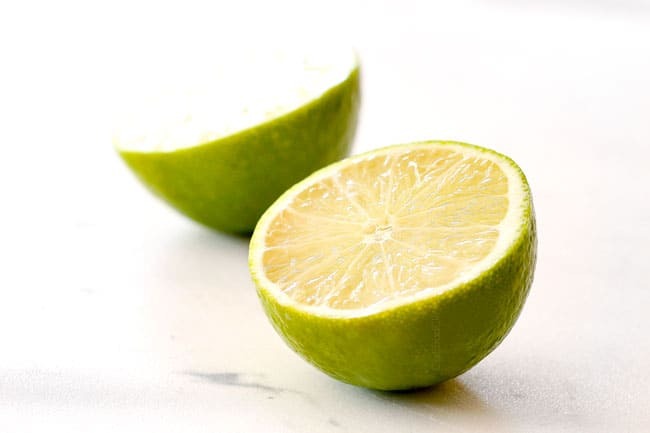 Lime: Use freshly squeezed lime juice. If you want more tangy flavor then use the zest as well. The lime brings out the freshness of all the ingredients. Salt: Tomatoes need salt to enhance their natural flavor so don’t skip or you Pico de Gallo will taste bland! Pepper, Garlic, Cumin. These seasonings are optional but I love depth they add to the recipe. I use garlic powder as opposed to fresh garlic because I am not one for raw garlic and the powder distributes more evenly. CHOP. Chop your tomatoes, onions, cilantro, and jalapeno. MIX. Add vegetables, lime juice and salt to a large bowl. SIT. Allow Pico de Gallo to sit at room temperature for at least 30 minutes. SEASON TO TASTE. Add more salt, pepper or lime juice as desired. 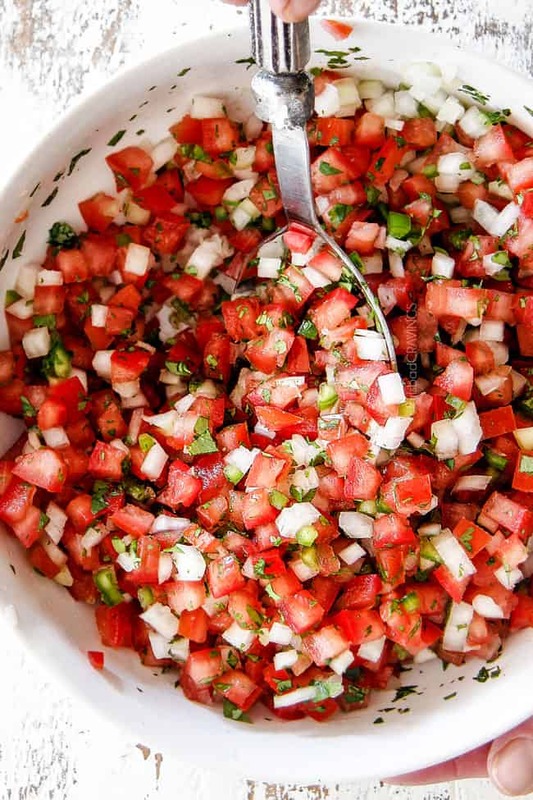 Making Pico de Gallo really is as simple as that! 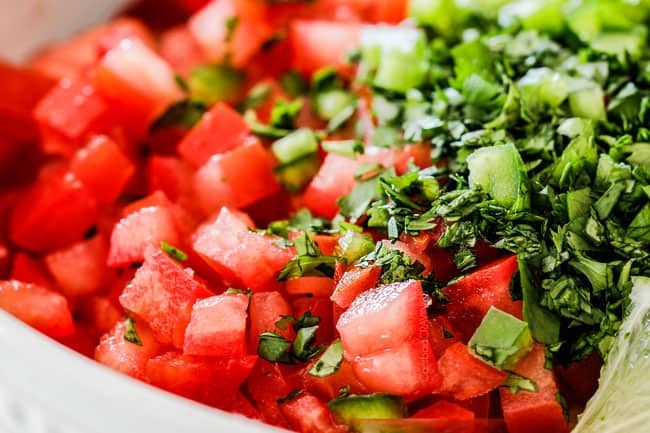 But because I love to talk about food and I love YOU and want you to have the BEST Pico de Gallo, I’ve included some tips and tricks below. 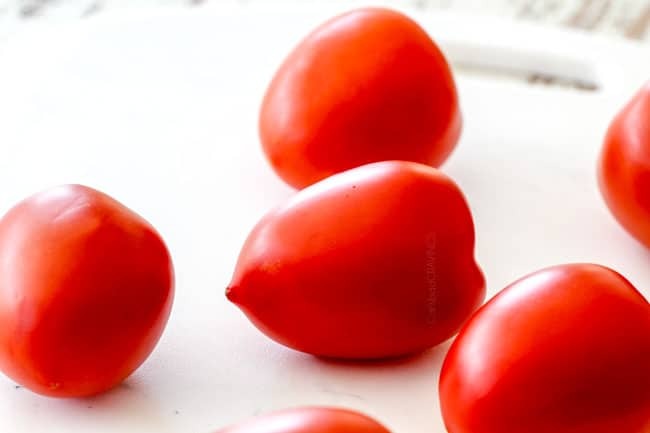 Remove tomato seeds. We are going to quarter our Roma tomatoes then scoop out the seeds and watery flesh because it doesn’t add flavor – only liquid – to our Pico de Gallo. Scooping out the seeds also helps the salsa store better without becoming overly soggy or watery. Take care to dice the jalapenos finely so the heat is evenly distributed throughout the Pico d Gallo. 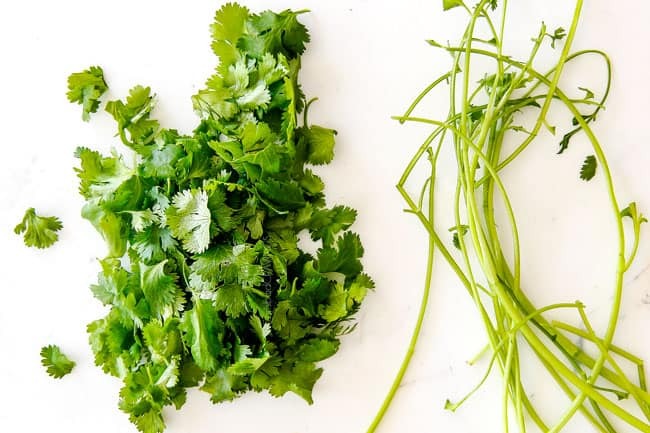 How to measure cilantro. Add the whole leaves without the stems to a measuring cup, before they are chopped. Loosely pack them in. Play with amounts. My Pico de Gallo recipe is a guideline but the quantity of each ingredient is really up to you. 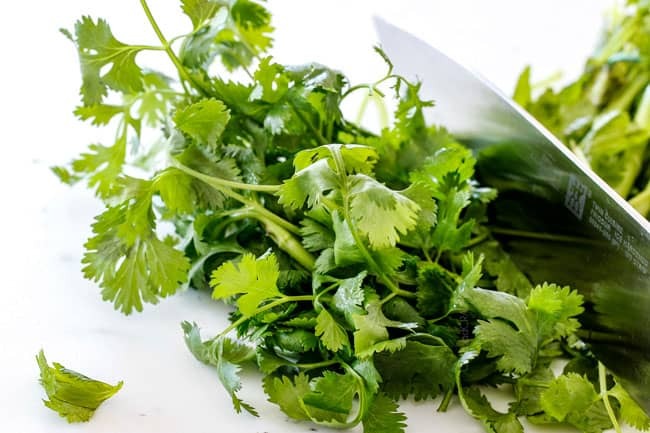 Love cilantro – add more! Don’t love raw onions – add less! 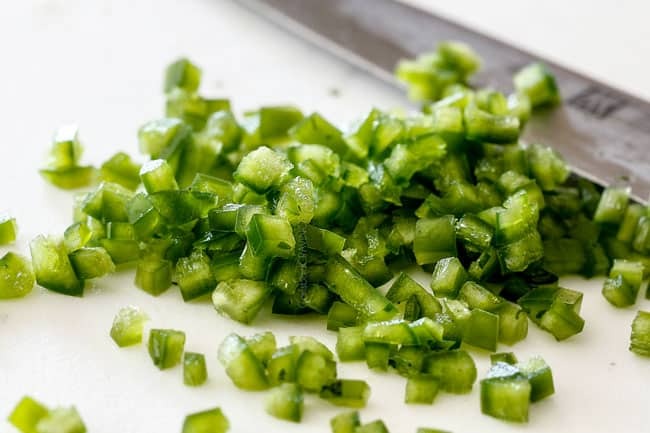 But don’t skip the cilantro – it is essential in Pico de Gallo. Let sit. After you combine the Pico de Gallo ingredients in a bowl, let them sit at room temperate in order for the flavors to meld together. If you taste it right away, I guarantee you will be disappointed. The salt draws out the flavor from the tomatoes, which we desperately want in this recipe. Sitting also tones down the raw onion as it mingles with the lime. Give your Pico de Gallo at least 30 minutes for the magic to happen. Adjust seasonings. I don’t suggest tasting and adjusting the seasonings until after the Pico de Gallo sits because only after the waiting period will you taste the true balance of flavors. After it sits, taste and adjust and add additional lime or salt, pepper and/or jalapeno seeds. If it’s missing something, it’s probably salt. Spice it up. If you want the Pico de Gallo to be spicier then add some of the reserved jalapeno seeds or a pinch of cayenne. Serve slightly chilled or at room temperature. If you serve Pico de Gallo really cold it will taste flat. If it has been refrigerated, let it sit at room temperature for 15 minutes. The flavor of your Pico de Gallo is completely up to you, so take charge and make it the best pico de gallo for YOU. Pico De Gallo is best consumed the same day it is made but can be stored in an airtight container in the refrigerator for up to 3 days. The longer it sits, the more mellow the acidity will become so you may want to add a fresh squeeze of lime juice to taste. You will also need to drain the accumulated juices released from the vegetables. Chopped avocados. Chop, mix and eat for a wonderfully creamy dimension. Mash avocadoes into your Pico de Gallo to create guacamole. You will want to add additional salt and lime juice to taste. Fresh sweet corn. No need to cook or grill, just add the corn straight off the cob. Cucumbers. You can use English cucumbers so you don’t have to peel them or peeled slicing cucumbers. If you use slicing cucumbers, you might want to remove the seeds if you are not eating right away so it doesn’t get watery. Black beans. Transform your easy Pico De Gallo into a delectable black bean salad. Red bell peppers. Always good for a sweet crunch! Mangos. I love mangos with everything. You can also add mango and avocado, or make mango guacamole with your Pico de Gallo. Ah, the possibilities! And if you’re intimidated by picking or cutting a mango, see my How to Cut A Mango Post. Other fresh fruits such as blueberries, strawberries, pineapple or tangerines to create a variety of fruit salsas. Fresh greens. Spinach, kale, cabbage, shaved brussels sprouts, etc. Fresh herbs. You can mix up the flavor profile by adding oregano, parsley, basil etc. Shrimp. Yum! Add some cooked chopped shrimp for a shrimp salad! What Should I Serve With PICO DE GALLO? Zoodles. Add pico de gallo to fresh zoodles for a quick summer zoodle salad. Pasta. Add directly to cooked pasta with a little olive oil or sauté for the base of a pasta sauce. Salads. Add to any salad. Salad Dressing. Add to salad dressing for an instant flavor boost. Now go make and eat the freshest Pico de Gallo you’ve ever had! 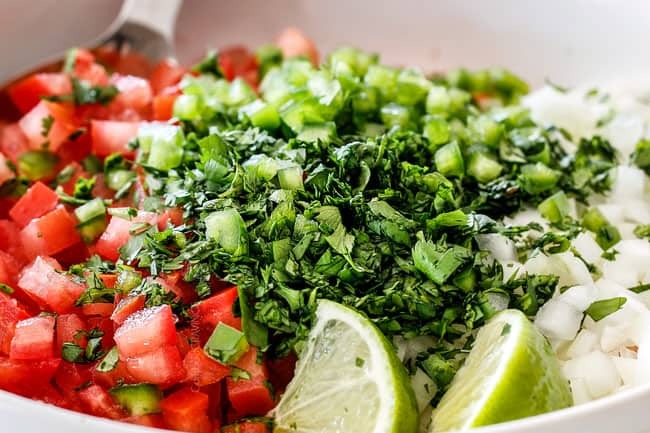 Want to try this Pico De Gallo Recipe? Pin it to your MEXICAN, SIDES or CONDIMENT Board to SAVE for later! 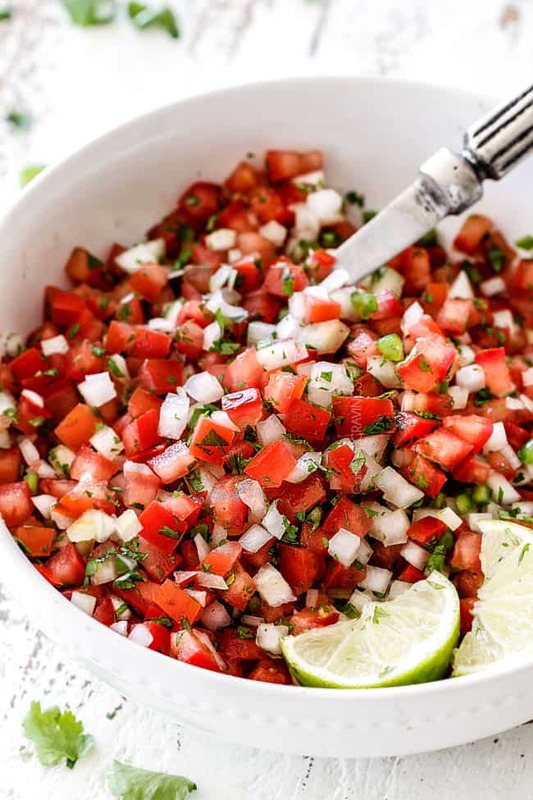 Pico de Gallo is quick and easy, made with only a handful of ingredients, amazingly fresh and healthy and makes everything taste 1000X better! It's made with just tomatoes, onions, cilantro, jalapenos, lime juice, salt and pepper. 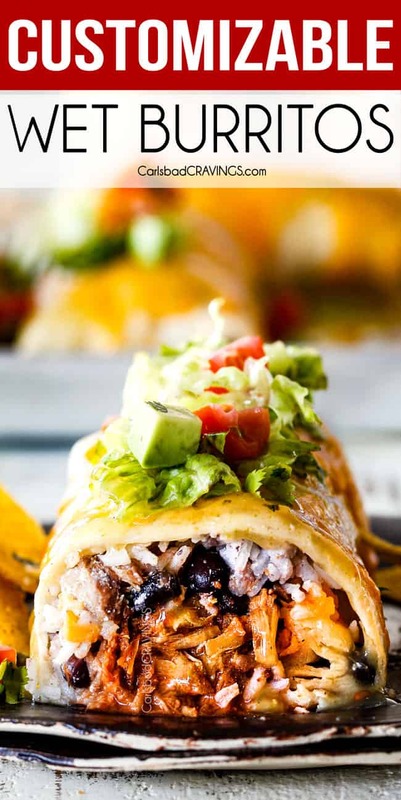 It takes minutes to whip up and is great as a party appetizer, snack with chips, or pile it on your favorite enchiladas, nachos, tacos and more! Add all of the ingredients to a medium bowl and stir to combine. Cover and refrigerate for at least 30 minutes. When ready to serve, taste and add additional lime juice, salt and pepper if desired. If refrigerated beforehand, let sit 15 minutes at room temperature so it doesn’t taste flat. Pick ripe yet firm tomatoes. Choose deeply colored, firm with-with-a-little-give, ripe tomatoes for maximum flavor because this recipe centers around the tomatoes. We want ripe but not overripe so they get mushy and fall apart. Also, make sure they smell like a tomato – if they don’t smell then they will taste like cardboard. Remove tomato seeds. 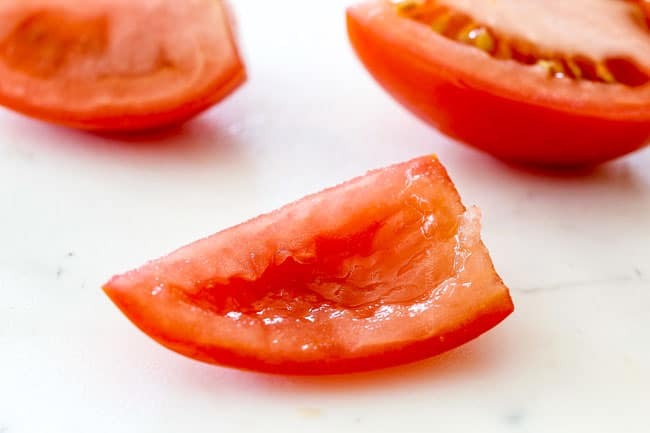 We are going to quarter our Roma tomatoes then scoop out the seeds and watery flesh because it doesn’t add flavor – only liquid – to our Pico de Gallo. Scooping out the seeds also helps the salsa store much better without becoming overly soggy or watery. Devein jalapenos. The ribs and seeds carry the most heat in peppers, so we are going to remove them but you can always add in some seeds later (as previously discussed). 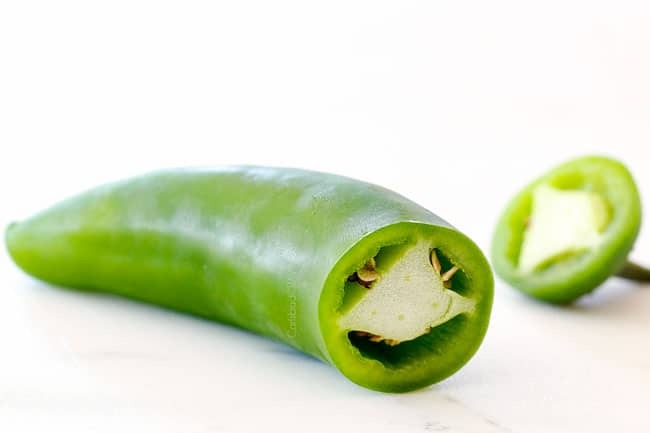 To devein your jalapeno(s), cut the stem off then cut the jalapeño in half lengthwise. Scoop out the seeds with a spoon or pairing knife. If there is still white rib remaining in some places, then slice it out. Take care to dice the jalapenos finely so the heat is evenly distributed throughout the Pico d Gallo. Never touch your eyes when dealing with peppers! Use freshly squeezed lime juice. If you want more tangy flavor then use the zest as well. The lime brings out the freshness of all the ingredients. Salt! Tomatoes need salt to enhance their natural flavor so don’t skip or you Pico de Gallo will taste bland. Play with amounts. My Pico de Gallo recipe is a guideline but the quantity of each ingredient is really up to you. 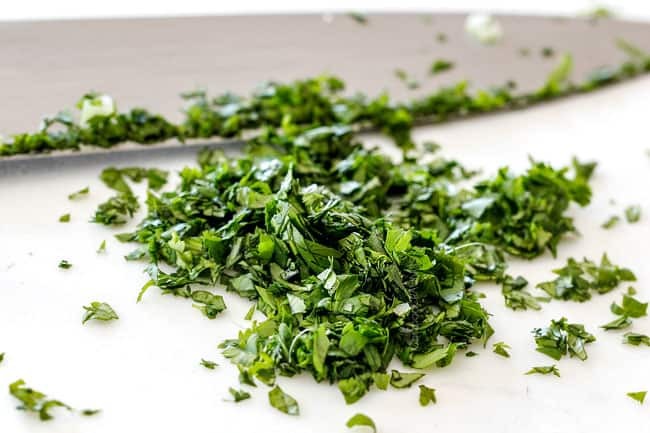 Love cilantro – add more! Don’t love raw onions – add less! But don’t skip the cilantro - it is essential in Pico de Gallo. I just wanted to say your blog is one of the best ever. 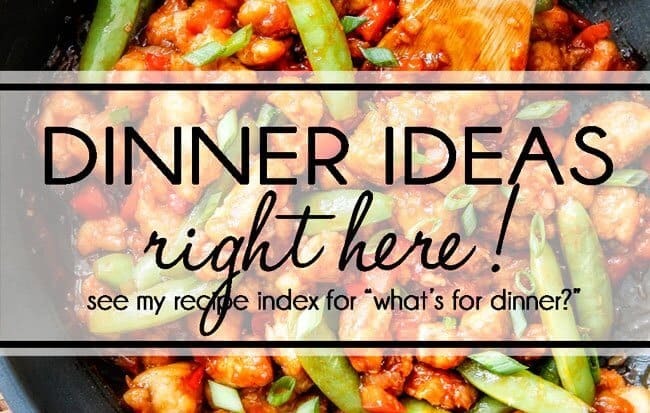 I follow tons of others but yours really stands out so thank you for the recipes. Tomatillos aren’t a thing I’ve ever seen in Australia so far. Shame. Maybe they are in the bigger cities. Thank you so much or making my day Sue! I am honored you love my bog so much. Calling around sounds like a great idea – someone has to have them! I look forward to visiting Australia someday! This is wonderful~!! Thank you~!~! I tried to click on the 5 stars and nothing happened. I will try again after this post. thanks again~!